The K�HL SLAX PANT solves the dilemma over what you want to wear versus what you have to wear. Featuring a technical fabric and masterful design, the SLAX PANT is fully capable of transitioning from the great outdoors to the office so you never have to choose between performance and style. 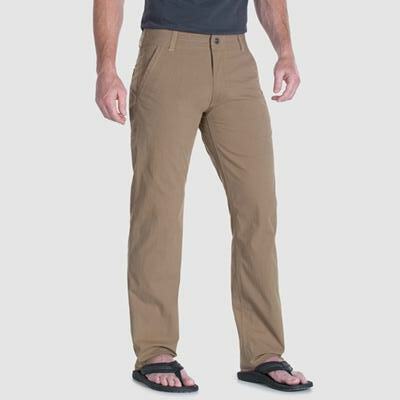 The SLAX PANT is cut from lightweight and abrasion resistant ENDURO fabric. This technical blend of cotton, nylon and spandex delivers performance without sacrificing comfort, durability or style. Featuring K�hl's KLASSIK fit, the SLAX is slightly less full in the seat and upper thigh. The Born Free Gusseted Crotch and stretch fabric allow freedom of movement. Chino-style flat front pockets and a stealth cell phone pocket provide storage in an uncluttered design. EQUALIZR� rear pockets create a perfectly level, clean, and incognito style in a groundbreaking design for the outdoor pant industry.